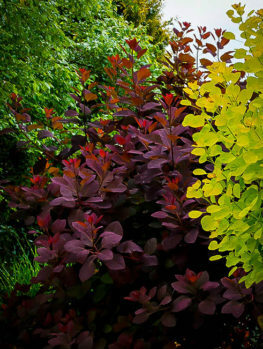 There are two kinds of plants commonly known as smoketrees, but among gardeners, the name’s usually applied to two species in the genus Cotinus. Found throughout the warmer parts of the northern hemisphere, including across the southeastern United States, the American and Eurasian smoketrees are both so popular that there are now dozens of cultivated varieties to choose from. Most of them are shrubs or small trees, usually growing up to about fifteen feet high – although some can reach up to 30 feet – and they’re best known for the delicate flowers that between June and September make them look as if they’re shrouded in pinkish smoke. 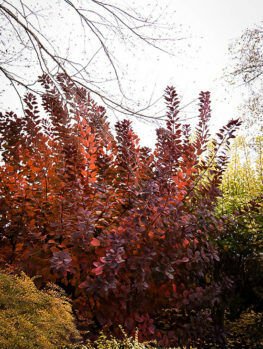 This effect, combined with their attractive foliage and spectacular fall colors, have made them a firm favorite especially for naturalized gardens. A smoketree isn’t large but it will normally live for decades, so you should view it as a long-term addition to your garden. That means before buying one you should spend some time to choose the best variety for your needs, pick the ideal spot for it and make sure you know everything necessary to get the best results. Here’s a guide to the essentials you need to know. Smoketrees aren’t difficult to grow, but success does depend on getting a high quality tree. Choosing one that’s been properly cared for in the early stages of its life will give you a tree that’s healthier, less stressed and not as vulnerable to pests or disease. The best way to ensure this is to buy one from a reputable nursery like The Tree Center. Once you’ve decided what smoke tree will suit your garden, order it from us. Sun: Plant in full sun. Most varieties can tolerate light shade but the foliage and flowers will be much more spectacular if the tree gets sun all day. Water: Smoketrees don’t need a lot of water once they’re established but they do need some when they’ve been recently planted – usually weekly for the first year, then every two weeks for another two years. When to plant: The best time to plant a smoketree is in late spring, when the chance of a late frost has passed. 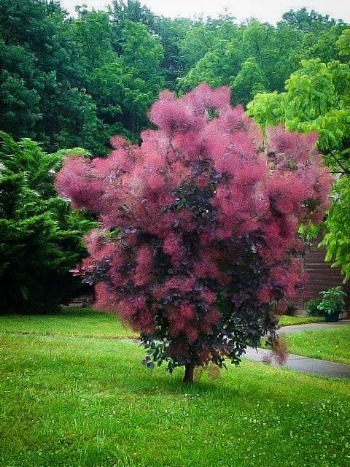 Choose the smoketree that suits your garden best, taking account of climate, soil conditions and space – then order it from The Tree Center. Once your tree arrives you should prepare the ground for planting. Check the size of the root ball; dig a hole twice as wide as it, and as deep as the ball is high. Mix compost into the soil you dug out, at a ratio of about one part compost to five parts soil. Next, unwrap the tree’s root ball and remove any string or wire. Unwind any roots that have encircled the ball, and loosen the mass. Place the tree upright in the center of the hole and half fill it with the earth and compost mix. Water lightly to settle the soil around the roots then fill the hole the rest of the way and tamp it down gently. The next step is to build a three-inch high ring of soil around the base of the tree, slightly wider than the root ball. Spread a two inch layer of mulch – shredded bark or wood chippings are ideal – inside the ring, leaving a small gap around the trunk to prevent rot. Water well and leave to stand for a few hours; check to ensure that the soil is moist but not saturated; add more water if required. Smoketrees are very tolerant of different soil types and can grow well in acidic, neutral or alkaline ground. Clay, loam or sandy soil are all suitable. However, slightly unusually, they do best in less fertile ground. If the soil is too fertile the tree tends to grow too quickly, taking on a coarse appearance; more seriously they also become prone to verticillium wilt and won’t survive more than a few years. 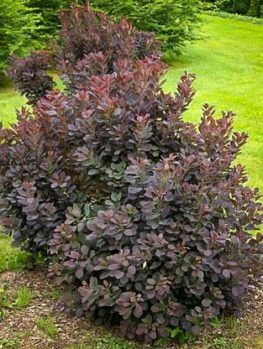 While compost is useful to get the smoketree established, after it’s settled in poorer quality soil will result in a more compact and bushier shrub. Fertilizer is rarely necessary – this is an adaptable plant that doesn’t ask a lot from the soil it’s planted in. It makes an ideal choice for a rocky patch in your garden – it will thrive where most shrubs won’t. While smoketrees do well in moist soil, once they’re established they are quite tolerant to varying conditions. They’re quite drought resistant and can also survive periods when the soil is saturated. Relatively dry soil is the best option, however; this will give you the best foliage and flowers. Therefore you should avoid locations close to water features like ponds or creeks, as the ground is likely to be too wet. If you do live in a wetter area a raised spot in your garden is a good choice for smoketrees. Because smoketrees prefer poorer quality, infertile soil, they rarely need any fertilizer. In most cases using fertilizer will result in the tree growing too quickly and becoming vulnerable to verticillium wilt, so it should generally be avoided. However mulch is a good idea. It can deliver small quantities of natural nutrients without the potentially harmful effects of fertilizer, and will also help keep the soil at a suitable moisture level. At the very least mulch should be spread inside the water retention ring while the tree is settling in, but once it’s established keeping the root zone covered will still be beneficial. Smoketrees are an outstanding choice if you’re looking for a spectacular small tree for your garden. Few other shrubs can create such an impressive effect, and it’s also a long-lasting one; while most flowering trees bloom for a few weeks in late spring, a smoketree will put on its display through most of the summer, usually from June to September and sometimes even longer. It can be pruned or coppiced to give a more compact form or allowed to grow naturally, although you should be aware that while pruning improves the foliage (and the fall display) it can reduce the flowers; we recommend that you keep pruning as light as possible. The American Smoketree is large, usually reaching a height of between 20 and 30 feet and about the same in width. 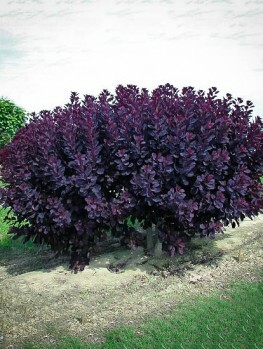 Its foliage is a striking blue-green color and it puts on a good display of purplish-pink flowers. Its fall coloration is particularly good, among the brightest of any native American species, and can range from golden yellow through orange, red and even purple. Grace is an average sized cultivar of the Eurasian smoketree, between ten and fifteen feet high. It has an open spreading form and is wider than it is tall. What makes it so popular is its coloring. New foliage is a bright red, which darkens and deepens through summer. Small yellow flowers mature into the characteristic smoky plumes from May to July, and the year’s display ends with a burst of gold, orange and purple leaves. It’s an ideal accent plant, or a good centerpiece for smaller gardens. The greatest benefit of smoketrees is undoubtedly their spectacular appearance. The actual flowers are small and usually inconspicuous, but the thin, colored filaments they develop as they mature give the tree an appearance that few other flowering trees can match. These trees also retain their flowers for longer than most other alternatives and provide a welcome spot of color when many other plants are fading in the summer heat. Their hardiness and tolerance of poor soil is also a big advantage; if you have a patch of poor soil a smoketree won’t only thrive there, it will turn it into one of the most beautiful spots in your garden. In general smoketrees are fairly robust, but there are problems that can affect them. By far the most serious is verticillium wilt, which is caused by a fungus that lives in the soil. This disease can affect more than 300 species of cultivated plants and is not only a particular problem for smoketrees, but also maples. It prefers more fertile soil, however, so smoketrees planted in poor soil are less likely to be affected. As well as verticillium, smoketrees can also be bothered by some more common problems. Watch out for scale or aphids, and leaf borers sometimes infest the foliage. However, with a good quality specimen from The Tree Center you’ll have a healthy and hardy plant that should resist most health problems.